One of the biggest mistakes I made early on in my teaching career was assuming that I must be the fount of all knowledge, especially when it came to my subject. The truth of the matter is that it’s impossible to know everything about our subject. In fact, there will be times when your students know more than you, especially when it comes to using technology! Coming to terms with this fact is an important step in our professional development as a teacher. How we deal with this realisation, however, can have a huge impact on our classroom! Don’t be afraid to let your students teach you! Don’t be afraid to let your students teach you, especially when it comes to using technology! Technology changes so quickly these days that it’s almost impossible to keep up. Every day I learn something new, and much of it from listening to young people. Be open to letting your students teach you something new and don’t be afraid to ask them for help! 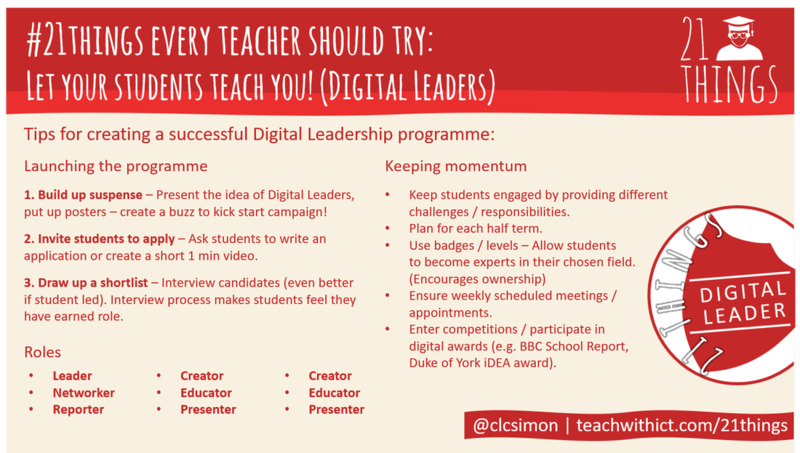 Anyone that knows me will know that I’m a huge advocate for student Digital Leaders. For those new to the concept, Digital Leaders are those students who are adept at using technology and are willing to share their knowledge and skills with others. Through working with staff, peers and school leaders, Digital Leaders are able to help shape how technology is used in and outside of the classroom.